If you’ve always lived with your family, on your own in student halls of residence, or even with a partner, living in a shared house with people you don’t already know can be a bit of a surprise. That said, most housemates thoroughly enjoy the experience, but things will go more smoothly if you follow these basic flat sharing tips when you move into your first house share. It’s well worth establishing written house rules for shared accommodation with your housemates – and when you’ve done so, displaying them somewhere that everyone can see them! They will help make everything clear so that no one is tempted to make assumptions that turn out to be wrong. This share house rules example provides a starting point for drawing up guidelines to help make your house share fun and straightforward. Smoking – check with your housemates and with the landlord about whether smoking (including vaping) is acceptable in the house. If you’re smoking outside in the back garden or in front of the house, place a suitable bin there and make sure you (and any other smokers) empty it regularly. Having friends to stay – To avoid finding that more than one housemate had invited a friend to stay over on the living room sofa, consider having a house calendar on the wall in the kitchen where you can book guests in, as well as noting when people are away on holiday, birthdays and even dates of landlord inspections. Having girlfriends/boyfriends staying over – Most flatmates will be relaxed about this happening from time to time, but if it’s more than a couple of nights a week, and especially if these are not matched by you staying at your partner’s place a similar amount, this can cause understandable stress to do with bathroom availability and hot water costs. In fact, it’s one of the most common house sharing problems. After all, a house that’s ideal for three can become cramped if there are really four people living there. And even if there’s plenty of space, if your partner is actually living with you, this should be formally recognised on your tenancy agreement. Broadband – avoid arguments about who’s used up monthly data quotas by having unmetered broadband. Where to dry your laundry – If there isn’t an obvious communal location to do this like a laundry room, it may be best for everyone to hang up their washing in their own rooms. Privacy rarely goes amiss when it comes to drying underwear. 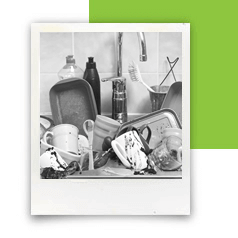 Washing up –For busy working people, a dishwasher is really the best solution here, but if your landlord doesn’t provide one or there isn’t space even for a slimline model, you need to agree a washing up rota – and stick to it! Waship up tip: Recognising that it’s never OK to let dirty plates build up in the sink, some house sharers hoard dirty crocks in their room to spare their hosuemates from them. While the intention is good here, this is rarely popular as the others find the china cupboard bare! The only solution is for washing up to be done at the end of each day to avoid stress. Who buys the toilet roll and the bin bags? – Many flatmates manage this amicably if everyone takes responsibility for buying these essential items from time to time. If that doesn’t work, draw up a rota or even assign responsibility for one type of item to an individual (but pay into a kitty in advance so they are reimbursed). Living in a shared house? Cleaning the toilet and bathroom. Emptying the kitchen and other communal bins. Washing the kitchen and bathroom floors. Hoovering communal areas including the stairs (decide amongst yourselves whether you want to be responsible for hoovering your own rooms). Tip: Make sure you all tidy up enough before your cleaner comes so that he or she can do their job – and you get the result you want. Basically, this just means putting things away in the kitchen and picking things up off the floor. Decide with your flatmates whether you want to engage a cleaning contractor who will bring in their own equipment and cleaning products, or whether you’re going to provide these yourselves. Remember that if you choose the latter option, you risk wasting your cleaner’s time and getting an unsatisfactory job if you don’t keep these stocks replenished. The main problems that occur in house shares stem from a change in the setup so that it’s not what people signed up for. This might be caused by a change in who’s living there or, as discussed already, someone bringing their partner to live there unofficially. Tension can also arise if someone more or less moved out to live with a partner elsewhere, even if they continue to pay their rent with you. This can throw household rotas and lead to arguments about bills for time they’re not around. In all cases, it’s best to call a house meeting and confront the issue as soon as it appears so that it doesn’t fester. When you’re living in a houseshare tips like these can go a surprisingly long way to ensuring that your home is somewhere you look forward to going back to at the end of a long day at work, and being in at the weekend. Need home insurance designed for flatmates?